bool(false) Is he a mix? looks full husky to me, but to know for sure you would have to do a DNA test. What dna test do you recommend? Is normal for husky to have so long coats? Wisdom Panel or Embark DNA test. some huskies have longer coats wail others have plush or short coats but its normal. As far as I can see yours is on the border between plush (longish) and a wooly ... doesn't mean that he's not 100% sibe. Hard to tell from that picture. Side view taken on the dog's level would help. That angle looks like could be mixed with Australian shepherd. Mostly the rear end of the dog looks off for husky and legs look unproportionally short. Could be pure but definitely not shandard. Beautiful Husky, I love his ears, they're pretty much exactly like my boy, Kohdi. How old is your dog, seems young. More pics would definitely help but you won't find a definite answer here, only opinions, from your average pet owners. When it comes to what is standard for a Husky, even though it is spelled out in a definition, how one interprets that definition, varies widely, even among the more qualified, like breeders and even dog show judges. You seem most concerned with the length of his coat. Your pup does not appear to be a wooly. A wooly is still a pure bred Husky, but it's coat does disqualify him from conforming to the standard. It's about the only thing about a Husky coat that everyone can agree on. Your pups coat also does not suggest, to me anyways, that it is the result of being mixed with another breed. As I mentioned before, your pup is beautiful, with awesome coloring and markings. 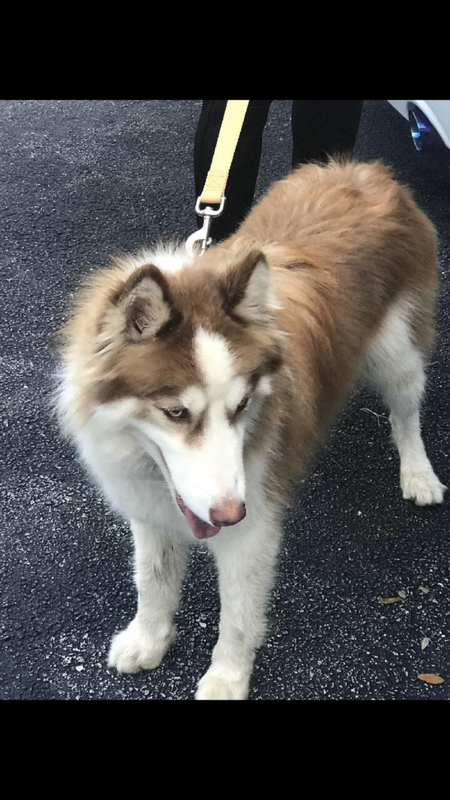 There are different lines within the Husky breed, and there are also breeders that mix different lines within their programs, all resulting in coats that can vary from tight and somewhat short coats, to plush fluffy coats, and everything in between. The thing most with expertise on the breed agree on is the coat and body structure not make the dog appear to be heavy, like a freighting animal, an Alaskan Malamute for example, and I don't see that in your pup. To find out if your pup is mixed with another breed though, your best bet is doing a DNA test and go from there. Wish I could be more help to you. I just don't see any blatant faults in your dog to suggest he's anything but Husky, and even in purebred dogs, faults can and do happen. Just to a lesser degree in the more reputable breeder programs. Only thing that stands out to me in the pic you posted, is his turned out rear leg, and that could just be a happenstance. If you search here on this site, there is a show dog section that has a really good, long thread on conformation. Maybe take a look at that, see if it helps you any. Why would you think he was a mix? You seem most concerned with the length of his coat. Your pup does not appear to be a wooly. A wooly is still a pure bred Husky, but it's coat does disqualify him from conforming to the standard. Jimmy - I'm gonna disagree with you on this - those ears with the tufting definitely are a wooly "tell" to me. Though, the trait does not seem highly expressed in this dog - no real leg feathers, only slightly fluffier on the body. Also - the fur around the face is slightly longer than I see in even very plush standard coat huskies. it's all good, Amy, all we can do is offer our opinions. Only scientific evidence can prove one way or the other, whether this dog is full Husky or not. I looked at the pic and I saw a Husky. . As far as its coat, the main fault for a Huskies coat, is "hair so long as to obscure the outline of the dog"., and this is *part* of the reason a wooly gets disqualified from conforming to standard. One of the other reasons being the Wooly's coat impedes it's function in the snow, example being leg feathers (which this dog seems to lack). It was explained to me here, on this site, just why being a wooly, having leg feathers, impedes its ability to function in the snow...the feathers allow ice to build up on the legs and paws, becoming very painful to the dog. The length of the coat of a wooly (something else I don't see on this dog) doesn't allow the coat to breathe as well and shed water as efficiently as a Husky with the medium coat, meaning it takes much longer to dry, and in the snow, isn't a good thing. These are the main reasons I ruled out this dog being a wooly. This particular dog has that tufting by the ears, and what I interpret as a somewhat strange length of hair on its whithers (?) --right behind the neck and going about half way along its back--but lacks the leg feathers and just the overall length of his coat doesn't obscure the lines of this dog, it just wasn't enough for ME to say it's a wooly or a mix. it's a beautiful dog, regardless! I love its look. Subject: Re: Is he a mix?